Just one Big 12 Conference men’s basketball team remains undefeated at home this season. That squad is No. 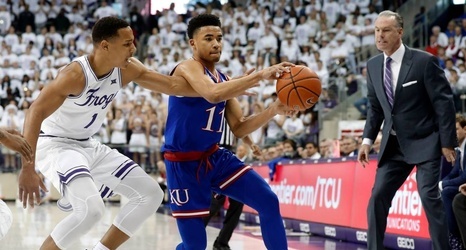 14-ranked Kansas, which handed TCU its first home loss in five Big 12 games, 82-77, in overtime on Monday night at Schollmaier Arena. Devon Dotson scored a career-high 25 points and Ochai Agbaji scored 20 points (with 11 rebounds) as the Jayhawks (19-6, 8-4), who entered the game 6-0 at Allen Fieldhouse and 1-4 on the road in league action, won their 13th straight game on ESPN’s Big Monday broadcast. Dedric Lawson contributed 14 points for KU (he fouled out with 2:26 left in OT), which halted TCU’s two-game winning streak.